Water Conservation Districts are special. We have a specific and critical role to recharge (conserve) water from our local rain and snowmelt into storage underground. For over 100 years we have been recharging the groundwater to keep water, that would flow to the ocean, here for use in the long hot summers and during droughts. Well operators in the District rely on us to help keep their water supply available for all users. We also manage Lands in the Santa Ana River and Mill Creek washes where we recharge for habitat, and we measure the local groundwater and surface runoff — which supplies essential information to local water managers. Well over 70% of the water used in the upper-watershed is groundwater and since 1912, the San Bernardino Valley Water Conservation District has conserved over One Million Acre Feet or 326 Billion Gallons of water by diverting the natural flow of the Santa Ana River and Mill Creek into 71 percolation basins that the District owns and operates. These efforts have improved water levels and increased the quality of the water in the region. To do this, the District receives funding from several sources including a small Groundwater Charge paid by all water production facilities (wells) inside the District Boundary. This funding supports the recharge activities we do. The District receives mining royalties, lease revenue, and grants; stakeholders also fund some of our efforts. The District was proud to earn the Certificate of Excellence in District Transparency and the District of Distinction of accountability and governance in June 2014. The District also helps to manage the Bunker Hill Groundwater Basin with the Cities, Districts, and Agencies in the upper-watershed, in partnership we bring ample high quality for all uses. The District plays an essential role for the basin serving as a member of the Big Bear Watermaster. The Watermaster is the impartial mediator and source of information for local water providers as well as legal "accountant" for the waters held and released from the Dam for the benefit of the region. The District has also recently restarted a key Habitat Conservation Plan for the Upper Santa Ana Wash Area in cooperation with our communities and partners including the resources agencies. Additionally, we have been selected to receive grant funding for Plunge Creek stream restoration to provide both additional habitat and water for the basin. Check out the Upper Santa Ana Wash Land Management and Habitat Conservation Plan (Wash Plan) for updates on this vital project. Qualified Water Efficient Landscaper (QWEL) training and list of landscapers by this EPA WaterSense Program. More information is on the QWEL Page. The State Water Board had approved State Drought Emergency Regulations available here to prohibit certain water wasting activities. 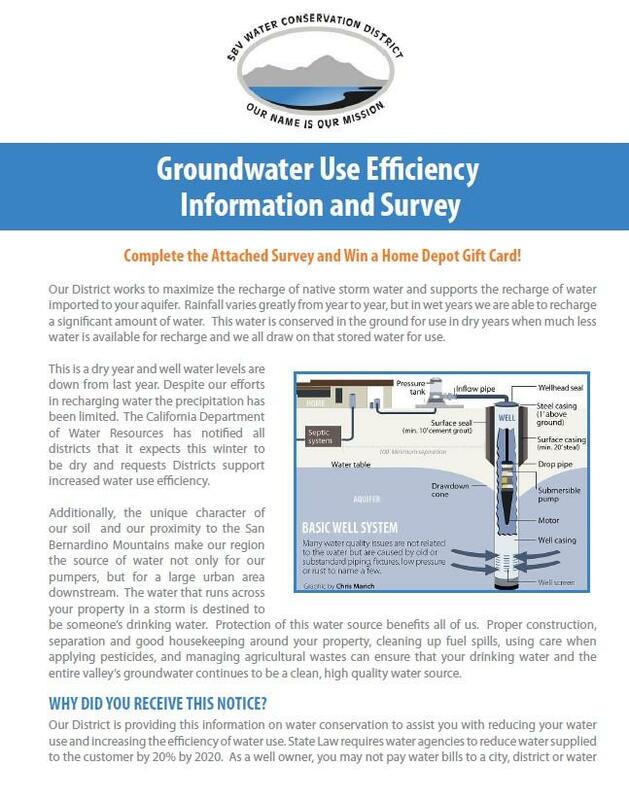 SBVWCD is not a local water agency but works with and supports local water agencies in this critical time. The District is near completion of the Santa Ana River Wash Plan, a Habitat Conservation Plan covering local infrastructure, expanded water conservation and mining and trails in the Santa Ana River Wash. 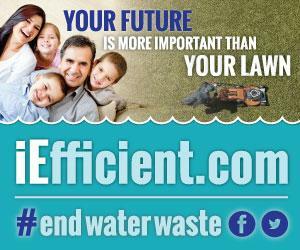 Learn more about what is in the Wash Plan for you! The District has been responsible for Water Conservation for over 100 years. Recharging the groundwater basin in wet times so you have water in dry years. Reduce Your use, hiring the proper professional, getting the proper training can save you money and water. EPA WaterSense Certified Landscaper Training available, click here for more.